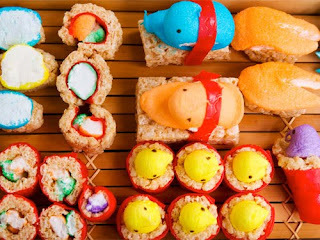 gastronommy.com: Peeps + Sushi = ? Peepshi! Created by Grace Kang on Serious Eats, the Peepshi recipe was posted just in time for Easter. And I'm reposting it just in time for... the end of Lent for those of you who cut out junk food! ... heh. She creates these little cute creations out of classic American snacks: Rice Krispy Treats, Foot by the Foot and Peeps! I'm not a fan of eating Peeps, but they do have a soft spot in my heart as America's favorite sugar coated marshmellows. Beheaded and served on a Rice Krispy Treat in all its glory. 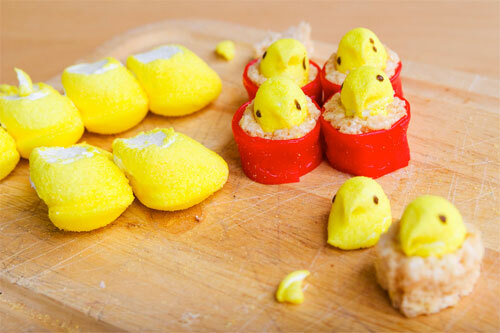 There were also attempts at Peeps themed dishes by other Serious Eats readers, like melted Peeps on a Pizza, but I'm not so sure they work as well as Peepshi. Blech. The Peepshi tradition calls for certain deviations from the standard sushi-eating customs you're used to seeing at, say, a sushi bar. Since Serious Eats has come to embody the contemporary Peeps revolution, I feel comfortable in providing a beginner's guide to enjoying Peepshi. It can be a roller coaster ride of sugar, and let me just say that you never want to be the first person booting at a Peeps party. 3. Use the extra Peeps bodies (there will be many) to create your own Peeps diorama! 4. Room temperature water is the ideal companion to Peepshi. Too cold and the sugar feels gritty in a bad way. Too hot and then, you're just drinking hot water. 5. Don't let silent Peeps screams deter you from your task. You're a professional.